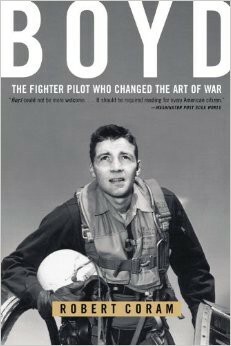 A great piece "Uploading John Boyd" over at The Strategy Bridge by Jason M. Brown, a group commander in the U.S. Air Force. He is a graduate of the U.S. Air Force Weapons School, Marine Corps Command and Staff College, Marine Corps School of Advanced Warfigthing, and Air War College. Adapting Isn't Good Enough: "...don't just be a reactor, be a shaper too." Several years ago, Jason tracked down a rare video of Boyd delivering “Patterns of Conflict,” the famous (and lengthy) briefing that framed his theory of warfare. At the urging of some junior officers (and a little technical coaching), he recently uploaded the video to YouTube. "while my views on Boyd have matured over the years, the videos reveal the sage discourse I sought from him, as well as prudent counsel appropriate for today." I love this whole piece which includes Jason's thoughts on Boyd's work, the slides from Boyd's work and the YouTube links of Boyd delivering his opus which is still very relevant today. Yes, even for the police, who often do not know of Boyd and if they do know him only know OODA Loop (as only a loop) and have know idea of his thoughts on Patterns of Conflict, The Strategic Game, Organic Design for Command and Control, Destruction and Creation etc. . This piece and the attached slides and videos gives those who study and utilize Boyd's ideas an opportunity to see him deliver those ideas. For me this was an outstanding opportunity to learn more about how Boyd thought which allowed me to dig deeper myself as to how these ideas apply to policing and then adapt them to how we train. Its an honor for me to link this piece here on my site. I want to thank The Strategy Bridge for allowing me to post here and also want to thank Jason for taking the time and effort to put this great work out, where it can be of great value to others. Police offcier, police leader and especially police trainers need to take a look at this work.